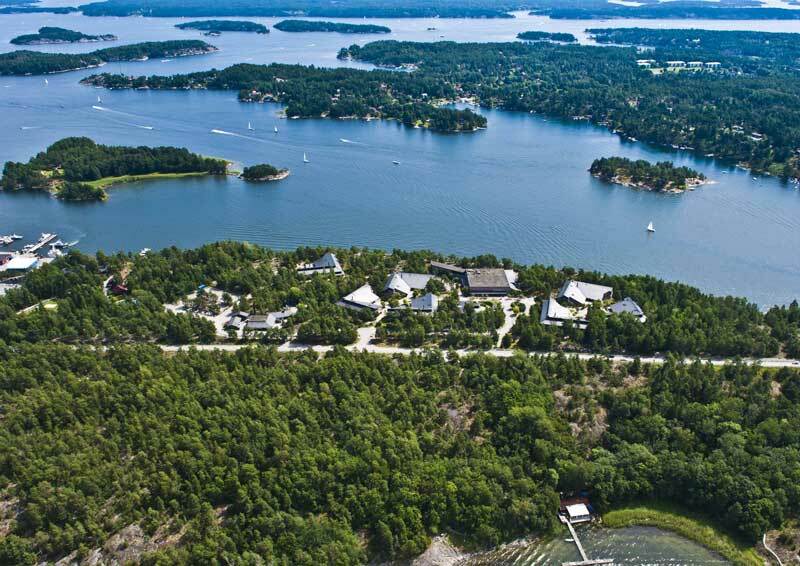 The summer school is held at Djurönäset in the beautiful Stockholm archipelago. In addition to excellent lecture rooms, there is a wide range of activities available such as running, swimming (indoors or outdoors), sauna, tennis, or just relaxing and enjoying the scenery. For more information, visit the Djurönäset web page. Djurönäset is located in the Stockholm archipelago 45 km east of Stockholm (and ca 80 km from Arlanda airport). The visiting address is Seregårdsvägen 1 in Djurhamn. The main road that goes past Djurönäset is Sollenkrokavägen. The GPS position is lat. 59, 2985 long 18,6740 and a Google map is at https://goo.gl/maps/KICfl. To get to Djurönäset by public transport, the easiest way is probably to take the aiport buses or Arlanda Express train to Stockholm Central Station and then continue by subway on the green or red line from T-centralen on any southbound train to Slussen (two stops). From Slussen you can take bus 434 all the way to the bus stop "Djurönäset" or bus 433 to "Djuröbron" and walk ca 1 km across the bridge. The travel time from Slussen is about 50 minutes. To get information about departure times, please go to the Stockholm public transport (SL) website and click on "Plan your trip". More information about how to get to Djurönaset can also be found here. A taxi from Arlanda Airport all the way to Djurönäset is slightly below SEK 1200 if you book via Djurönäset (at info@djuronaset.com) to get their special rate with the local taxi company. A general word about taking a taxi in Stockholm: The taxi market is unregulated, and so you should make sure to ask for the price beforehand, and to ride with one of the major taxi companies, such as, e.g., Taxi 020, Taxi Stockholm, or Taxikurir. From Arlanda they all have flat rates to central Stockholm (around 500 SEK). Again, you should always check the price beforehand when taking a taxi, because there are no upper limits on what taxis are allowed to charge, and if you ride with some other operator than the big ones there are scammers around (in particular, please check that it says *exactly*, e.g., "Taxi Stockholm" on the taxi and not "Taxi i Stockholm" or "Stockholm Taxi" or whatever). Going by the meter when getting around by taxi in central Stockholm should be fine if using one of the major companies, but it never hurts asking beforehand roughly what the price should be anyway.